The Williams Formula 1 team is to float on the Frankfurt stock exchange in an official public offering. 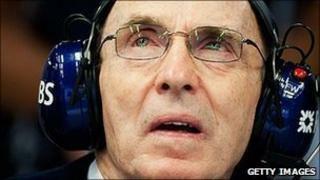 Sir Frank Williams will remain majority shareholder and team principal. The IPO will include a public offering in the UK, Germany, Switzerland and Austria, with the first day of trading in its shares in early March. There will be a private placement for institutional investors outside those European countries, and outside the US, Canada, Japan and Australia. Swiss-based Bank am Bellevue AG will act as sole global co-ordinator of the IPO, and the offering will consist of up to 27.39% of existing shares, which is 2,739,383 shares. Williams are one of the most successful teams in F1, but they have slipped from the pedestal they occupied when they dominated the sport for much of the 1980s and 1990s. They have not won a championship since 1997 and last won a grand prix in 2004 and have in recent years struggle to raise the budget required to compete at the front. Williams finished sixth in the constructors' championship in 2010 and at the Brazilian Grand Prix the German Nico Hulkenberg took their first pole position for five years. Hulkenberg has not been retained for 2011 after Williams decided to take on the Venezuelan rookie Pastor Maldonado, whose presence is linked to a multi-year, multi-million pound sponsorship deal with his country's state oil company, PDVSA. Their lead driver will continue to be the Brazilian veteran Rubens Barrichello, a former Ferrari driver who has competed in more grands prix than any other driver in history.